Flint, Michigan — The University of Michigan-Flint (UM-Flint) is receiving one of the largest donations in its history: a 16-story building featuring academic space, student housing and a conference center. URC purchased the facility, which was then called the Character Inn, in 2009. The purchase and subsequent renovation were supported through $27 million in repayable grants made by the Mott Foundation to URC’s affiliate, the Foundation for the Uptown Reinvestment Corporation. The Mott Foundation is waiving the balance of those repayable grants to allow URC to transfer the property to UM-Flint. Borrego noted that the Mott Foundation’s support for UM-Flint goes back to the very establishment of the university and has continued for more than 60 years. The decision to accept the Riverfront property comes just two months after the University of Michigan Board of Regents authorized the purchase of one of FirstMerit Bank’s downtown buildings for $6 million. The Riverfront is next door to the FirstMerit Bank building and is connected to it through an elevated walking tunnel/bridge. 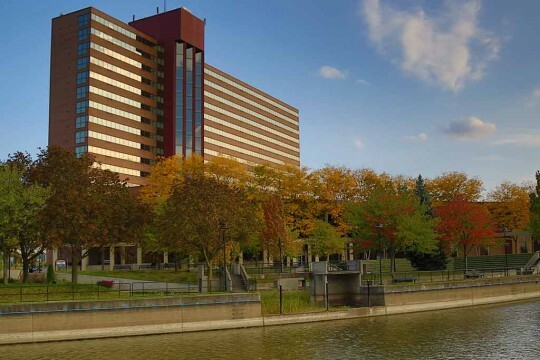 The Riverfront, constructed in 1981 as a Hyatt Regency Hotel, is a landmark downtown Flint building that will add to the existing campus footprint. Today, the renovated facility includes a movie theater, laundry facilities, fitness center, gaming area and community kitchen. It sits along the Flint River and the Flint River Walk, both of which run through campus, and it is directly across the street from the University Pavilion along Saginaw Street. The Riverfront has the capacity to house more than 500 students. First Street Residence Hall, which is currently the only on-campus housing option, is home to 300 students. That facility opened in 2008 after five years of planning and a cost of $21.3 million. In addition to providing UM-Flint with a significant increase in on-campus housing without the expense of building a new facility, the Riverfront includes a conference center, which can be rented for events of up to 1,200 guests. Riverfront already is home to the UM-Flint’s School of Management and is frequently used by the University for other functions. This also will save UM-Flint the annual cost of renting space in the building. The Charles Stewart Mott Foundation has supported the University of Michigan-Flint from its inception. Charles Stewart Mott pledged a contribution of $1 million in money or land, or a combination of both, if voters approved the $1.6 million bond issue in 1950 to form a four-year university in Flint. The Mott Foundation granted $1.2 million in 1955. The Flint campus was officially established in 1956. 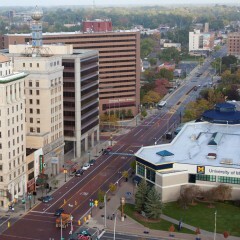 In 1972, the Foundation donated $5 million over five years to build the UM-Flint campus at its current downtown location. The groundbreaking was in Willson Park in 1974. The grant was later increased to $6 million. Funds were used to construct the University Center (Harding Mott Building). 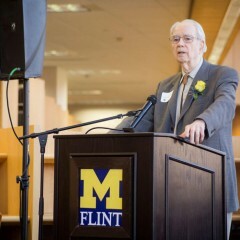 Subsequent grants in support of UM-Flint include $6 million in 1978 for the Recreation Center; $2.9 million from 1988 to 1990 for the Frances Willson Thompson Library; and $1.9 million in 1991 for the University Pavilion. Between 1994 and 2001, the Foundation granted $10.3 million to expand the campus on the north side of the Flint River. This included construction of the William S. White Building. Other major grants to the University of Michigan include $6 million in 1964 and $25 million in 2005 for the C.S. Mott Children’s Hospital in Ann Arbor. In all, the Mott Foundation has granted more than $92 million to the University of Michigan for projects at its Flint and Ann Arbor campuses. 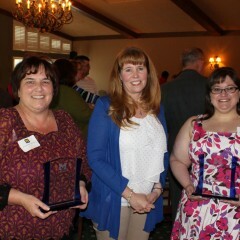 These funds have supported various projects, programs and initiatives, as well as major capital improvements.